CodeTwo Outlook Attachment Reminder is a free add-on that can be useful for every user of Microsoft Outlook. The program scans a content of your e-mail and if it finds expressions, such as e.g. 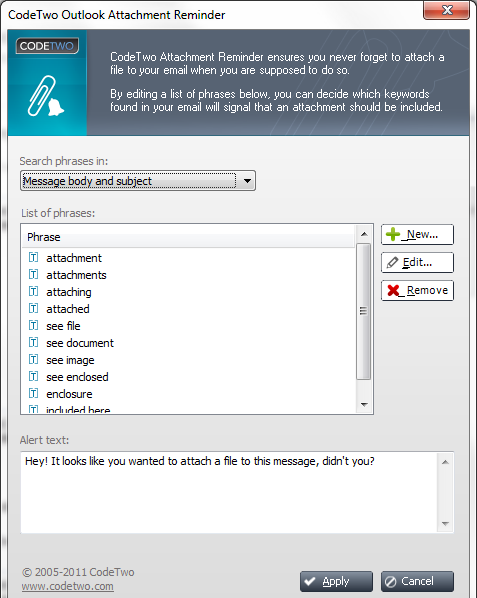 'enclosed' or 'attachment', it recognizes the message as the one that should include a file. The application alerts you when you are about to send such message without appropriate files attached. Owing to this, you can avoid stressful situations. CodeTwo Attachment Reminder reminds you about adding attachments to your e-mail. ...... You can also decide if the program should scan message content, subject or both. Awake Reminder is used to create calendars and event reminders. Qweas is providing links to CodeTwo Outlook Attachment Reminder 1.1.0 as a courtesy, and makes no representations regarding CodeTwo Outlook Attachment Reminder or any other applications or any information related thereto. Any questions, complaints or claims regarding this application CodeTwo Outlook Attachment Reminder 1.1.0 must be directed to the appropriate software vendor. You may click the publisher link of CodeTwo Outlook Attachment Reminder on the top of this page to get more details about the vendor.